Barefoot Gen is often compared with Studio Ghibli’s Grave of the Fireflies — both concern themselves with the dire situation in Japan as World War II drove to a close, and both movies view the war through the eyes of children. Barefoot Gen is a comparatively sloppy movie: The animation isn’t particularly strong, and the voice acting for the kids is raw and weak (mainly because actual children are providing the voices). But there’s one moment in Barefoot Gen that will be burned into my memory for life: The moment when the bomb is dropped on Hiroshima. I’ve watched so many war movies that I am almost numb to the violence. Real violence still shakes me to my core — I think you’d have to be inhuman to not be affected by it in some way. But through the haze of fiction? We see so much violence in our stories (and have for decades; this is not a new development) that it’s difficult to be shocked by it. 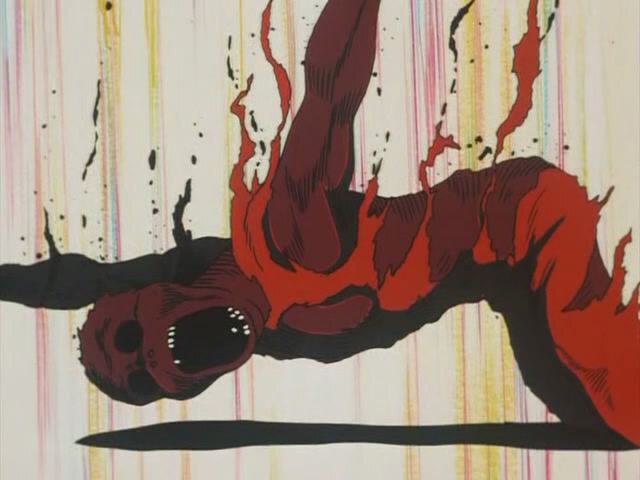 When the bomb drops in Barefoot Gen, however, the way the nuclear fire rips through the citizens of Hiroshima is so raw and disturbingly detailed that I felt it deep down in my gut. It’s not something that is played for entertainment; it’s something that exists so that humanity will never forget. However one views the sides and roles of World War II, the bombs dropped on Hiroshima and Nagasaki — along with the other numerous horrific events and battles of the war — should never disappear from our collective memory. Every day that passes, I hope we can learn from the past and move closer to an era where such brutal conflict is unnecessary. The cynic in me thinks I’ll die disappointed; the optimist in me thinks movement even by centimeters is a worthy goal.